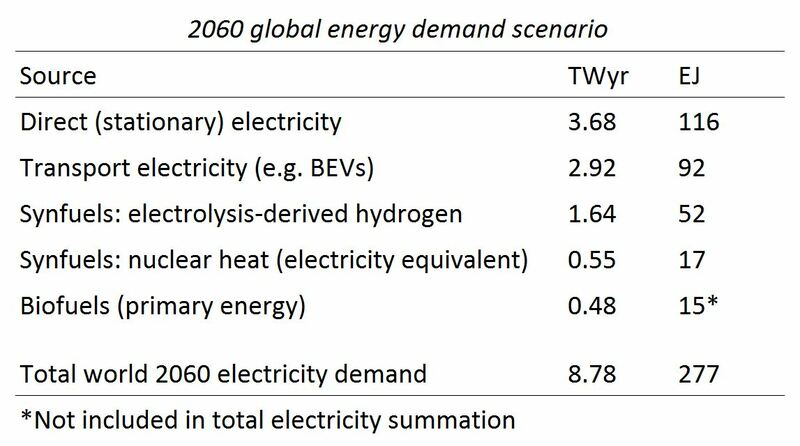 In a previous post on BraveNewClimate — TCASE #The energy demand equation to 2050 — I estimated a mid-century global primary energy demand of ~1000 EJ (see here for definitions). But it may as well have been 2060; the actual date that this global demand will be reached is obviously uncertain, but will likely occur between 2040 – 2070 given current levels of energy growth. This figure was also arrived at by Moriarty & Honery (2009) based on a meta-review of the literature. Let’s use this as a working figure. 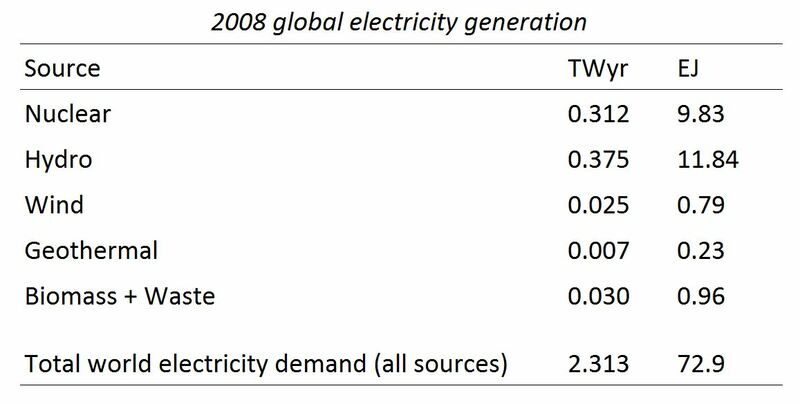 Table 1 shows world electricity demand in 2008 based on IEA data from non-fossil-fuel sources, plus world total including fossil fuel generation. Note that a terawatt year (TWyr) is the same as 1000 GW of constant power. So nuclear power, in 2008, delivered an average of 312 GWe, and global electricity generation was 2,313 GWe. Table 2 shows a hypothetical 2060 demand scenario, which uses the forecast values from Trainer (2010) for energy efficiency/conservation, direct electricity, transport electricity (e.g., battery electric vehicles) and liquid fuels (see also this shorter, free-online piece); however, my estimate of the source of liquid fuels is different (see explanation below). Note that in Table 2 there is a projected overall 3.8-fold increase in world electricity use between 2008 and 2060, compared to an approximate doubling of overall primary energy usage (today we use ~500 EJ from all sources). Both of these figures — for electricity and primary energy growth — are in agreement with the estimates of Starr (1993). Trainer assumes that up to 50 EJ/yr will come from biomass-derived cellulosic ethanol (requiring 1 billion ha and 7 t/ha yield); he also leaves an unmet deficit of 12 EJ/yr. I more conservatively assume a lower contribution from biofuels of 15 EJ/yr (300 million ha). The remaining 47 EJ/yr of primary energy from liquid fuels is assumed in my scenario to come from synfuels (e.g., hydrogen and hydrogen-nitrogen derivatives such as ammonia or hydrazine), which are synthesized using energy from nuclear fission sources (Forsberg, 2009). (i)	One third of hydrogen (~16 EJ) will come from electrolysis at a 30% electricity-to-hydrogen conversion efficiency; this will require 52 EJ of electricity input. (ii)	Two thirds of the hydrogen (~32 EJ) will come from direct nuclear heat via high-temperature sulphur-iodine-catalysed thermochemical water cracking, at a 60% heat-to-hydrogen conversion efficiency. This thermal energy requirement is the equivalent of 550 GW of electricity plant, if one assumes a 33% Carnot-cycle efficiency that is typical for thermal-to-electrical conversion in fission reactors. The ratio of direct stationary/transport electricity use to that used in synfuel manufacture (electrolysis and nuclear heat) in Table 2 is 0.24. By comparison, Eerkens (2006, pg 135) estimated a final ratio of 0.4, but did not include battery electric vehicles or biofuels. The 116 (direct) and 92 (transport) EJ electricity figures come from Trainer (2010). If you assumed that all of the 277 EJ of electricity in Table 2 was generated at a thermal-to-electrical conversion of 33%, then this is 831 EJ of primary energy. This would imply efficiency/conservation savings of 17% on the 1000 EJ original demand target. I hope to use the above 2060 scenario in an upcoming paper that I am currently writing, and so would appreciate any feedback/constructive criticism from BNC readers. In the next SNE2060 post, I’ll consider my most realistic assessment for the multi-source energy supply equation for 2060 which delivers 277 EJ of electricity — from both nuclear and non-nuclear sources. Hydrogen per se is a poor choice for vehicle fuels, but it can be a feedstock for production of dimethyl ether (diesel substitute) or methanol (gasoline substitute). I agree 100% with the goal of high temperatures for hydrogen production at ~50% efficiency with the S-I cycle, but this requires temperatures near 900 C.. Stainless steel 316 structural materials may be qualified to 800 C. New materials (eg silicone impregnated carbon) must be qualified to be able to reach temperatures for the S-I cycle. Until then, the copper-chloride cycle [http://aiche.confex.com/aiche/2005/techprogram/P20544.HTM] may suffice to separate hydrogen at 40% efficiency at 550 C. The outlet temperature of an IFR is about 530 C, but it’s close. Molten salt reactors such as LFTR or PB-AHTR reach higher temperatures. I’ve guessed at least 50% for efficiency of conversion of the potential energy of molecular hydrogen to that of synthesized methanol or dimethyl ether petroleum substitute vehicle fuel? Who knows? The scale is enormous. A single US refinery [eg Baytown TX] produces 475,000 bbl/day, or 33 GW. World refining capacity is about 70,000,000 bbl/day, or 4800 GW. To meet the challenge, the world will need to stop use of fossil fuels for trains, ships, and small automobiles. Large transport trucks and airplanes will always need petroleum-like fuels; each engine on a 777 airliner can deliver 200 MW kinetic energy! My crude estimate put the 2050–2060 energy demand at 10 TWyrs, after efficiency gains. That is a whole lot of energy. This can be accomplished by factory production of Generation IV reactors. Either all Uranium reactors or a mixture of Uranium and thorium reactors. There are potential health related savings with a mostly electric energy system. Synthetic and bio fuels, may well have health related costs. I shudder when I see bio fuels of any description touted as some sort of solution to energy problems. Surely there has been more than enough damage done by land clearing,agriculture and pastoralism in order to feed runaway levels of population? By the way,I saw the film,”Gasland”,last night.It is not a well made movie in the technical cinematic sense however it does get a powerful message across on the hazards of gas production via fracking of the reservoir strata. Coal Seam Gas is all the rage amongst the booster set in Queensland,where I live. There is a lot of coal under prime agricultural and pastoral land.Consequently there is a huge potential for land and water degradation with a cost in food production. In addition,most,if not all,of the gas produced will be exported and will do nothing for Australian energy requirements in the longer term – greed and stupidity rampant,again. The IEA’s optimistic projection for oil is at odds with those who note crude oil output appeared to have hit a peak 2005-2008 and is decline, now slow but likely to accelerate. The reasons for synfuel should be re-iterated. For starters fuel cell propulsion systems remain too expensive and fragile despite high efficiency. Early proton exchange membrane fuel cell cars cost half a million dollars each and the cells deteriorate after a few hundred hours. They need cryogenic hydrogen filling stations with associated expense and hazard. Ceramic fuel cells that can burn hydrocarbon fuels are apparently unsuited to vehicles. Synthetic hydrocarbons have major handling advantages like high boiling point, low porosity and less piston engine ‘knock’. Lastly they have high energy density (higher heating value per mass) of say 20-40 MJ per kilogram, compared to say 0.2 MJ/kg for lead-acid batteries. Synfuel will be necessary to keep aircraft flying. Battery cars that have an onboard generator will find that synfuels will give them greater range. However it’s hard to imagine a world with 800 million of these expensive vehicles after oil is largely depleted. Other ideas like hydrogen smelting of iron ore would need the hydrogen plant and the smelter in geographical proximity. Again it’s hard to imagine a world that could adapt to such radical cost changes with the enormous pressures of just providing food, shelter and health care. Why would you ever want hydrazine as automotive fuel? It is highly toxic, odourless, unstable, carcinogenic in animals(suspected in humans) and corrosive. The amount of renewable plant required to provide the quantity of energy that would be needed through a winter month in 2050 would require annual investment some 30 times the present proportion of world GDP (Trainer 2010a). This would leave untouched the most serious problem, which is what to do when there is no sun or wind for several days in a row. I cannot tell from his little article what assumptions he is making when he makes his assertion about investment requirements. 3 % growth? I am largely persuaded by Ted’s arguments, even as I support nuclear power. I think we need nukes even with a steady state world economy. I’m curious what Ted thinks of the nuclear arguments put forth here and to what extent they modify his general thesis. I’d also like to know more details underlying his investment calculations. Real life capitalism, in my view, stands virtually no chance of achieving the coordination required on a global scale to plan that kind of investment hike. we’re much more likely to get trade wars, currency wars, shooting wars mixed in with panics and phobias. (2) excess carbon removal and sequestraion as C or CO2. proves possible to scale up enough to provide C for burying and CO for FT conversion in hydrocarbon fuels. 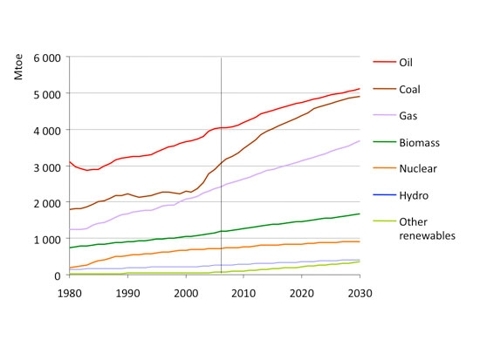 The dark horse in all of these fuel-mix projections, (especially fifty years on) is predicting the role of storage technologies. Ultimately they will determine the viability of a fully electric transportation sector. Frankly, I am somewhat disappointed in that there has been less progress on this front in the last ten years that I hoped. This likely indicates that it is not going to be any easer going forward, and only incremental gains can expected. Thanks for the valuable feedback. Why hydrazine? It’s a liquid with about the same energy content as petroleum. It is currently used as rocket fuel and could have a role in the aviation industry or combusting in ICEs. Easier to store than hydrogen. But if it doesn’t work out and ammonia takes all the roles that it would take, that’s no problem. Whatever works. I didn’t include boron metal in the above, but that’s another potential synfuel, along with dimethyl ether etc. The key point, which remains unchanged, is that we can envisage — roughly speaking — the magnitude of the energy replacement challenge in swapping over from oil-based liquid fuels to synfuels of various descriptions created using nuclear and or alternative energy sourced electricity. One question for Robert or others — if we went down the dimethyl ether or methanol paths, what do you envisage is the (economic) source of the carbon? Thanks for pointing out the alternative copper-chloride pathway — Dan Meneley also pointed this out to me. Charles, my estimate above has it at ~8.5 TWyr/yr, rather than 10, but the figures are sufficiently ‘loose’ that either value is quite defensible. Podargus, the 15 EJ from biofuels may come in a large part from microalgae or crops on low-yield lands that don’t displace crops. But if 15 EJ is too hard to reach, then, well, there will need to be more nuclear/other capacity to create more synfuels. I’ve tried to be generous to a few different technologies, and this decision will be made a little clear in the next post of this series. Regarding the cost of carbon for dimethyl ether etc, I suppose there will be CO2 available from coal power plants for some time in the future, at negative cost. At 3 ¢/kWh, methanol can be made for $1.09 a gallon. They told me that methanol has only half the energy per gallon as regular unleaded gasoline, so you would need $2.18 worth of methanol to equal one gallon of gasoline. Then you have to transport the stuff and pay taxes on it. The numbers for Green Freedom synthetic gasoline produced with 3 cents a kilowatt hour electricity look bad. He said $5.00 a gallon including all taxes and transportation costs, so that is about 50% more expensive that what we have today ($3.30? gallon). The good news is that they have a process called Green Freedom Hybrid. They take natural gas and combine that with the Green Freedom process and they get synthetic gasoline for $2.70 a gallon at a electricity cost of 5 cents per kilowatt hour. At the 3 cent level that might come down to $2.25 to $2.50. He had not worked out the exact math on a 3 cent electricity cost. I think, but am not 100% sure, that is the full retail cost including all taxes and transportation. They explained that when you process natural gasoline to make synthetic gasoline, you come out with an excess of hydrogen atoms. Instead of throwing that hydrogen away, you use it to make gasoline with the original Green Freedom method. This lowers the cost. He also said this new process reduces the atmospheric carbon impact of using natural gas. I don’t know anything about typical U.S. prices, but $5/gal is only $1.32/L, and that’s not an astonishingly high increase relative to present prices, for petrol in Australia. Nor in Canada for that matter. I just filled up at $1.20CDN twenty minutes ago. Robert,that Green Freedom synfuel process certainly looks promising.Of course,it needs nuclear power to function economically and to be carbon neutral. It is certainly another point in favour of nuclear if only we can get the powers that be to lend at least an open ear – if only. I understand most methanol in Australia comes from a refinery in Altona, Vic. It retails for about $1.30/L. Dirt track racers use it in large block V8s with superchargers. Even though the energy density at 20 MJ/L is well under that of petrol at 35 MJ/L the racers claim that it gives a smoother throttle response and the fires after inevitable rollovers are less incendiary. Methanol can be blended with petrol to give M85 but I believe piston engines will need higher compression. There is apparently a problem with electrolyte seepage when methanol fuel cells are scaled up to vehicle size. I’ve said before I think compressed methane should be the vehicle fuel of the future since methane has multiple sources (fossil and non-fossil) and the processing losses are low. However it’s hard to see compact hybrid cars with both a large traction battery and a large gas cylinder. Therefore we will have to make some liquid fuel that is more energy dense and less toxic than methanol, hopefully based on non-fossil carbon. An afterthought on fuel pricing; the OECD along with other unsolicited advice has called for Australia to end fossil fuel subsidies. A major subsidy is the diesel fuel rebate which along with bulk purchase discounts enables heavy vehicle operators to pay around $1/L for diesel. That is also an income tax deduction for businesses. Removal of the diesel rebate of around 18c would be political suicide for any government so it won’t happen. However what happens when oil depletion drives the subsidised price up to say $2/L ? – to earn export dollars. I assume these new gas fired power stations may have to pay up to $6 a gigajoule ( or million BTUs) for gas. Suppose truckers will pay $2 for 35 MJ of fuel, be it diesel or NG, ignoring the compression penalty. That’s (2 X 1,000/35) or $57 per GJ. That is while generators want to pay $6 per unit for gas truckers will pay more like $60. My guess is that the govt will fiddle with rebates and fuel taxes to reduce that gap. I’d like to see the govt come up with a forward looking plan that says how much gas will be exported, how much burned in power stations, how much for transport as well as the traditional uses such as heat and fertiliser. In the UK, they pay the US dollar equivalent of $1.17 per liter in taxes alone compared to $0.08 per liter in Florida. The Brits are paying a carbon tax 15 times greater than us Floridians. Can anyone explain to me why they should want to do that? England has about the same area as Florida but over three times the population. Maybe they’re rationing space on the roads. 1)Raise revenue. If it is cut, some other tax must rise, as expenditure is being cut by ~25% over the next five years already in an effort to try to balance the books. 2)Make good fuel economy important to car buyers, so we buy smaller/lighter cars and manufacturers have more incentive to put resources into making vehicles efficient, rather than maximising performance. Back towards topic …. the energy content/gallon of methanol is half that of (petrol/gasoline), but that doesn’t mean you need twice as much of it. Methanol has a very high octane number, which is further inhanced by its high latent heat, which can be used to cool the incoming air charge and allow even higher compression ratios, and also reduces the work required to do the compression. Standard IC engines running on gasoline get 20-30% thermal efficiency, occasionally more if you’re very careful. A methanol-optimised engine will get 40-45% – higher and more consistent accross the power range. The result is that you only need 1.2 – 1.3 gal of methanol to replace 1 gal of petrol, IF the engine is designed to take full advantage of the methanol. A flex-fuel vehicle would not do as well. For the carbon source – lots of work is being done on air capture of CO2, it seems easier than one might expect for a 0.04% minor component. Before that, carbon capture (but not long-term storage) from existing power plants, followed by conversion to methanol/DME might have a transitional role. You make hydrogen from the nukes at night when electricity demand is low, store a few hours worth, run the old fossil plants as peakers, capture the CO2, store a few hours worth, make methanol steadily. Not zero-carbon, but lower than burning oil. The economics, compared with building enough reactors to cover peak demand and a separate synfuel production infrstructure, would need detailed study. An all counts methanol (not ethanol) produced thermochemically from biomass would seem to score better. That assumes we can soup up small piston engines to run better on alcohols. I repeat my belief that the fuel of the future is natural gas which is why we shouldn’t burn more than we have to in power stations. Thanks for the link DV8. It’s an idea that will have support from the coal industry, and then probably promoted as “clean” energy – despite CO2 being a combustion product. Sometimes all one can do is sigh. There is an energy requirement for the cracker, but no direct CO2 from the process. Which is roughly 640 kg of CO2 released for each tonne of ethanol, on top of whatever is required for energy. However clever Celanese is with their process, the atom balance enforces this. So ethanol from Celanese is even worse than from BP. Nice work, guys! Very clever, but I wish they’d left it in the lab until we had nuclear hydrogen and biochar to feed it with. I frankly doubt that projecting a doubling of energy demand by 2060 is going to be anywhere close to accurate. Just imagine the energy that’ll be needed to desalinate all the water that at least 3 billion people need, and the energy it’ll take to move it around. Then assume that with global communication reaching virtually every corner of the planet, those in developing countries who today use nearly zero energy will all want a developed nation lifestyle. If we’re going to get anywhere close to that becoming a reality, energy use will explode (figuratively). Efficiency gains notwithstanding, a doubling seems entirely unrealistic. Of course if one is content with a grossly stratified world where billions are energy-poor compared to the rest, then maybe (just maybe) a doubling might be realistic, but I doubt even that scenario would work looking at the desalination requirements. The scale of it is simply mind-boggling. I too am highly skeptical (as one of the commenters above) of the contribution of biofuels in any meaningful amount. Synfuels derived from nuclear-produced hydrogen make a lot more sense (not used as pure H2 but in stable forms like NH3). By the way, the outlet temp of IFRs that Robert Hargraves mentions in post #1 can safely be bumped 20 degrees to enable the more efficient hydrogen production that he describes.